Posted on December 27, 2014 December 17, 2014 by SherylPosted in OtherTagged family history, genealogy. OMG she’s such a little doll! I find that I keep going back and forth between the picture of her as a young woman and this one. What a lovely photo to have! I can’t imagine what it must be like to have your grandmother at your wedding. I only ever knew one of mine and the other died when I was nine. I was very fortunate to still have two grandparents living when I was a young adult. And, the grandfather in the picture lived long enough so that all of my children can remember their great-grandfather. It’s nice to hear that you like it. Very special moment and one when neither of you could know about the diary blog to come or even have imagined the technology. How true–I didn’t know about the diary at that time, and never would guessed that I’d be interested in family history now–and, my goodness, who would have guessed how far technology would come in the years since my marriage. What a special photo! Again, it’s so interesting to see the author of this diary with you. Beautiful bride, handsome groom! Thank you!! I really appreciate that you took the time and effort to do this. You are very skilled at restoring old photos. It’s wonderful to be able to see all the facial expressions more clearly. Looks like the mid-70s…and being plunged into yet another era is so unexpected, but in an exhilarating way! (And what womanseyeview said). 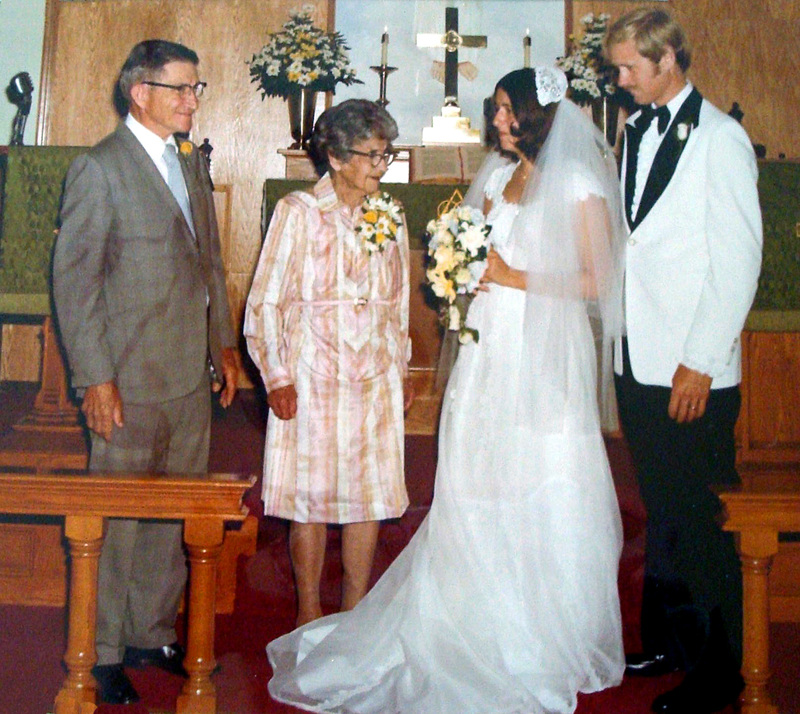 I am lucky enough to have a similar photo of my own wedding, same era, with my grandparents. Yep–you’ve got the right time period. It amazing how styles change from year to year, and decade to decade. Oh this makes your whole blog come alive with meaning. When I look at Helena, I feel like I have known her since her youth and known her life in that small rural community and all the wisdom she collected and shared with us a hundred years later. And you look so beautiful. Well,, I just love the photo and it brings it all together in a very special way. Thank you for your kind words. It’s wonderful to know that the diary and this blog have made her seem like someone you know. As dorannrule says this brings everything together so nicely. It’s nice to hear that this post helped pull things together for you. Such a joy to see Grandma at your wedding. We all will miss her soon. Thank you for sharing Grandma with all of us. God Bless you Sheryl! Thank you for all of your support and kind words. I’ve really enjoyed getting to know you via our blogs. I think that we tend to approach things in similar ways. It is interesting to see how people change across the years. How lovely to have your grandparents at your wedding. We had just one – my husband’s grandmother. I was very fortunate to still have two grandparents when I got married. What a special treasure such a photo is. I dug my wedding album out to look for this photo. It was fun to look at all of the pictures of my wedding day. Beautiful picture of my talented cousin, Sheryl and my grandmother. Cousin–Thank you for the kind words. One of the highlights of this blog for me has been reconnecting with you. I may have missed some posts with this answer on it, but did you ever have a chance to read through the diary with your grandmother or was this found after she passed away? That would have been so neat to have gone through it with her! Love the picture! The diary was found after Grandma passed–so no, I never went through it with her. I wonder what she would have thought about what she’d written as a teen. Love! It’s so great to see Grandma as a senior. Please remind me (or share a link) but did you and Grandma talk about her diary? Or did you find it after she died? The diary was found when her children were cleaning out her house after she passed. This is so cool! You! Helena! You and Helena, in the same photo of such a special day! I’m glad you saved this for late in the game . . .
It’s nice to hear that you liked the photo. It’s hard to be believe that I’ve reached the end of Grandma’s diary. The time seems like it’s flown. I love this. For some reason it’s making me teary. Not in a sad way, though. I know what you mean. Weddings are like that. She would have been in her early 80s. I’m sure I read somewhere that she didn’t live long after your wedding, so she lived a good long life. What a divine picture of you both. Lots of good memories there!!! I’m glad you liked the pictures. You’re right– there are lots of wonderful memories. What a blessing her diary has been. Life, one hundred years ago, was much different than it is now. To see your grandmother “all grown up,” it’s hard to correlate this as the same young woman milking the cow, working the hay, etc. The diary gave us a glimpse of a time we couldn’t imagine on our own. There sure were a lot of changes during my grandmother’s lifetime. I’m very fortunate that she kept a diary when she was young.